Pekin Bantams are very docile, and with careful and regular handling they will be happy to sit on their owner's lap to be stroked and petted. They make ideal pets for families with younger children for this reason. 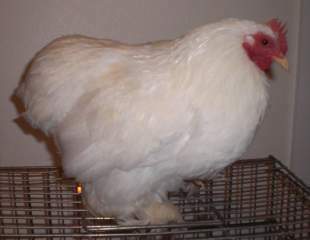 However, the Pekin bantam cockerels can still be aggressive and defensive of their territory and mates once they reach sexual maturity. Pekin bantams are round, and their carriage tilts forward, with the head slightly closer to the ground than their elaborate tail feathers. 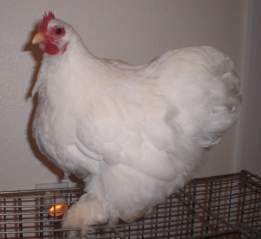 This 'tilt' is a key characteristic of the pekin bantam. They have sometimes been described as looking like little walking teacosies, or feathery footballs. The cockerels often have longer feathers that protrude outwards from their feet. The range of pekin colours is extensive, including black, white, buff, lavender, mottled, buff and red. Rarer colours are in great demand, and many breeders spend years perfecting new lines of colours in their birds.